Taste test: Very, very crunchy and thick potato chips. 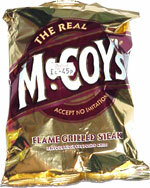 Has a pretty good steak taste, but not as good as other steak-flavored chips we've had. We really like the thickness and crunchiness of these. Pretty good. Smell test: Smells like steak sauce, kind of a mild onion smell too.